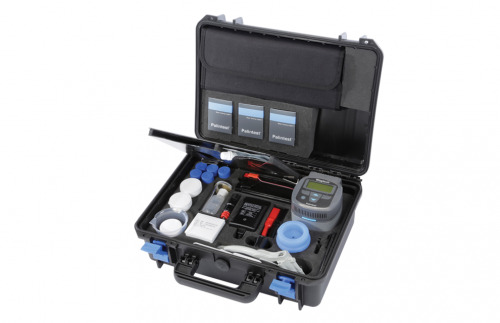 Widely used by organisations involved in large-scale emergencies or simple water quality testing projects, the Potatest is a lightweight microbiological test kit offering low-cost, rapid response testing of basic water quality parameters. Supplied with consumables and parts sufficient for processing/analysing 200 samples. Wagtech incubator with standard test protocols and audible prompts, petri dish racks, high performance lead acid battery with capacity for at least 5 cycles per charge, mains charger with international adaptors, vehicle socket battery power lead, crocodile clip power leads. Membrane filtration assembly, bronze disc, pistol grip vacuum pump with no-kink silicone tubing, media measuring devices (MMDs x5), 38.1g membrane lauryl sulphate broth, Pasteur pipettes (x5), hand lens, forceps, aluminium re-usable petri dishes (x20), sterilised and sealed membrane filters (x200), absorbent pads (x200), absorbent pad dispenser, steel sampling cup, sampling cable. Membrane lauryl sulphate broth, 500g (MLSB) powder for field preparation of nutrient media. Supplied in sealed pack with tamper seal. Membrane lauryl sulphate broth, 38.1g MLSB powder for field preparation of nutrient media. Supplied in sealed pack with tamper seal. Membrane filters (200 pack) - White, gridded membrane for simple colony count. 0.45 µm mesh size, 47 mm diameter, supplied in sterile sealed individual pack. Absorbent pads and membranes (200 pack) - White, gridded membrane for simple colony count. 0.45 µm mesh size, 47 mm diameter, supplied in sterile sealed individual pack. Absorbent pads, 2 packs of 100 each for use with absorbent pad dispenser. Membrane filters (1000 pack) - White, gridded membrane for simple colony count. 0.45 µm mesh size, 47 mm diameter, supplied in sterile sealed individual pack. Absorbent pads and membranes, 1000 pack White, gridded membrane for simple colony count. 0.45 µm mesh size, 47 mm diameter, supplied in sterile sealed individual pack, 5 packs of 200 each. Absorbent pads, 10 packs of 100 each for use with absorbent pad dispenser. Absorbent pads (100 pack) - for use with pad dispenser. Wagtech incubator - Replacement incubator for Potatest+, Potakit + and Potatech+. Excludes mains adaptor, in-vehicle charger and external battery connectors. Membrane filtration unit - Complete membrane filtration unit including sampling cup, retrieval cord, gas-grade silicone filtration assembly, reversible filter cup, bronze disc. Aluminium petri dishes (x20), 47 mm diameter. NutriDisk pack for faecal streptococci Azide NutriDisk set, 100 tests, supplied in sealed packs of 10. NutriDisk pack for pseudomonas aeruginosa Cetrimide NutriDisk set, 100 tests, supplied in sealed packs of 10. NutriDisk pack for E. coli and faecal coliforms M-FC NutriDisk set, 100 tests, supplied in sealed packs of 10. NutriDisk pack for total coliforms and E. coli Chromocult NPS NutriDisk set, 100 tests, supplied in sealed packs of 10. NutriDisk pack for total colony forming units plate count NutriDisk set, 100 tests, supplied in sealed packs of 10. NutriDisk pack for salmonella typhi Bismuth-Sulphite NutriDisk set, 100 tests, supplied in sealed packs of 10. NutriDisk pack for E. coli ECD NPS NutriDisk set, 100 tests, supplied in sealed packs of 10. NutriDisk pack for E. coli and coliforms Endo NPS NutriDisk set, 100 tests, supplied in sealed packs of 10. Size Özel Müşteri Temsilcisine Sahip Olacaksınız. Teknolojik Gelişmelerden İlk Siz Haberdar Olacaksınız. 24 Saat İçinde Teknik Destek Alacaksınız. Sorularınız 1 Saat İçinde Cevaplanacak. Palintest Analitik Cihazlar ve Limited Şti.